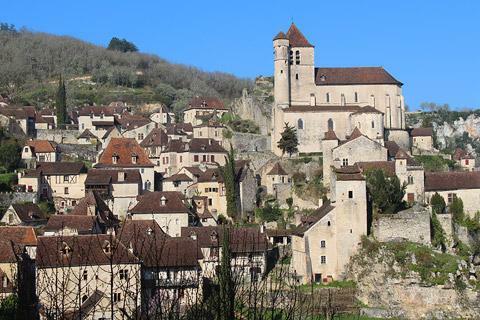 The lovely village of Saint-Cirq-Lapopie is listed among the 'most beautiful villages of France', In our opinion, its stunning position perched over the Lot River and the historic centre make it one of the most beautiful of these 'beautiful villages of France'. 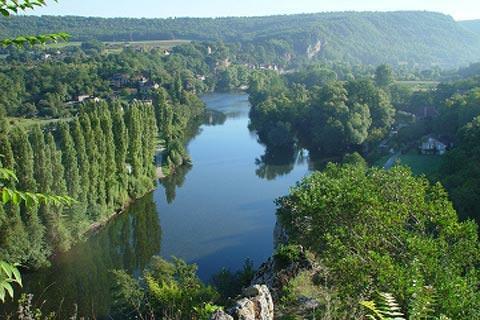 The village is situated 20 kilometres east of Cahors in the Lot region of France and falls within the 'Causses du Quercy Regional Natural Parc'. 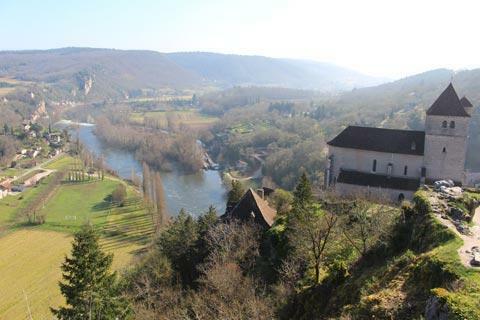 Due to its situation between the river and the cliffs parking is a challenge when you visit Saint-Cirq-Lapopie: the only parking close to the village centre is marked P4 while the other car parks are a few hundred metres from the centre, which can then be reached by footpath or with a special tourist bus. 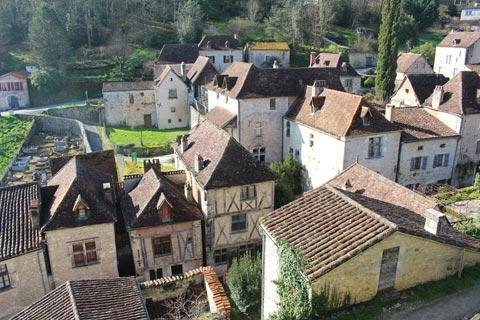 You enter the village from above and descend through the medieval streets. 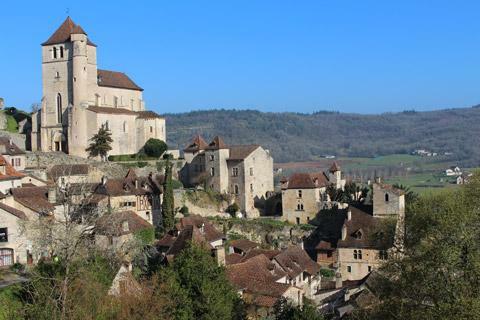 Before heading into the historic centre we suggest you follow the main road down the hill: this road has many exceptional views of the village and is one of the high points of a visit to Saint-Cirq-Lapopie. At the highest part of the village you can see the remains of the three fortresses that once stood here. Although little remains of the actual castles, you still feel a great sense of history and of course the views are very impressive: the castles are on a protruding cliff and you have views in both directions along the Lot Valley as well as across the village rooftops, views that you can't see from anywhere else in Saint-Cirq-Lapopie. Just below the castles you can see an impressive 15th century roman style church. The interior of the church was a disappointment but the outside is impressive and dominates many views of the village. From here you can now explore the historic centre of the village. 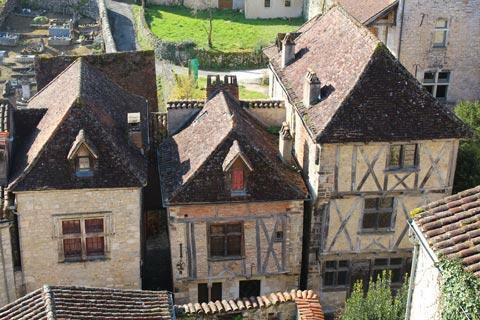 The narrow cobbled streets of Saint-Cirq-Lapopie contain a lovely mixture of medieval houses, some in colombage (half-timbered) and some in the yellow stone typical of the region, with small terraced gardens adding to the overall beauty of the place. Many of the houses we see today date from the 13th to 16th century. There are also several restaurants in the village centre. Our favourite is the Gourmet Quercynois that offers well cooked local products and good value for money and if time permits you can try others such as Le Cantou, La Tonnelle and L'Oustal. In fact almost all the restaurants in the village are good quality so allow plenty of time for lunch! 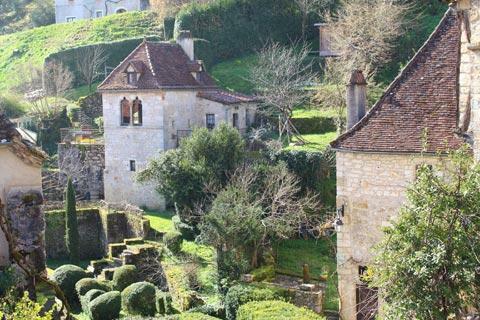 We don't often recommend small local museums in French towns but one notable museum in Saint-Cirq-Lapopie is the Rignault Museum, a carefully restored village house and guardhouse that also has a lovely garden and amazing views along the river valley. Below the village next to the river there are an assortment of old mills and buildings testifying to the activity of the village in centuries gone by, and you can enjoy this by following along the ancient tow path next to the river Lot. A short distance east of the village there is a leisure area with a river beach. 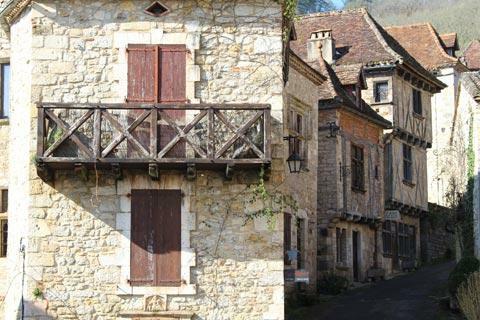 Nowadays Saint-Cirq-Lapopie is home to numerous artists and artisans, many with small shops and boutiques in the centre. This trend started perhaps when Andre Breton made his home here and declared that he had, as a consequence, "stopped wanting to go anywhere else". France This Way comment: Saint-Cirq-Lapopie is one of the most popular tourist destinations in the Lot area and should not be missed if you visiting the region. As with many of the 'most beautiful villages' it is best seen early in the morning - for the better light, and for the smaller numbers of tourists bustling around. If you are staying nearby you will want to return more than once: for example the village has a quite different character first thing in the morning with the mist rising off the river, or after dark when the castle and village is lit up. 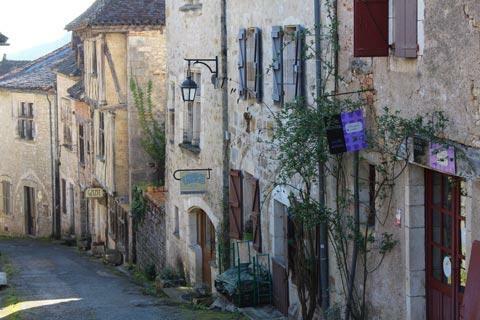 The quiet village we see today is very different to the town that stood here in the Middle Ages. 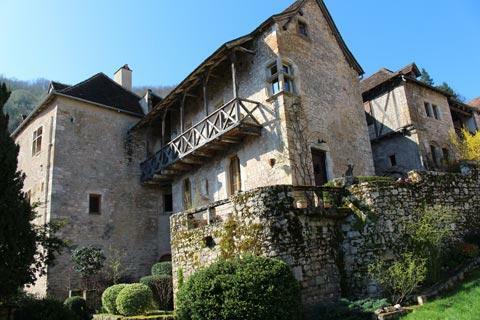 At that time for several centuries it was an important regional centre within the historic Quercy region and home to the Lapopie, Cardaillac and Gourdon lords. Its role originally developed in part because of its position on one of the important pilgrimage paths to Santiago de Compostelle that cross France. 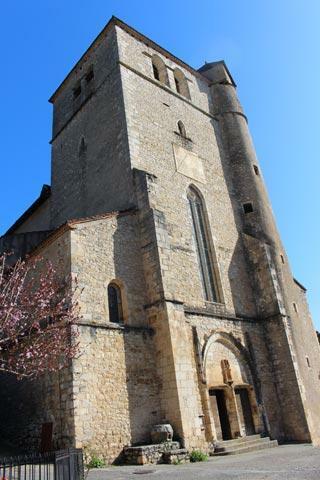 Saint-Cirq-Lapopie also played an important role in the Albigensian crusades against the cathars, the Hundred Years War and the Wars of religion. The tow path in the village (signed Chemin de Halage de Galin) continues about five kilometres west to Bouzigues. In part carved into the rockface, this is an exceptional walk along the river and highly recommended. 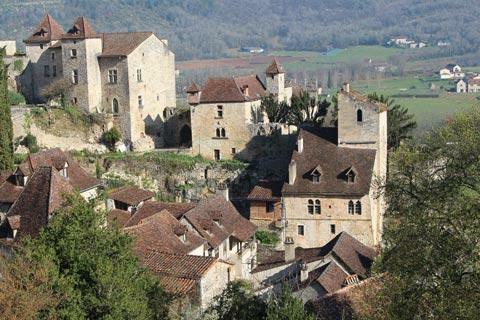 Several different feudal dynasties lived in Saint-Cirq-Lapopie in the Middle ages, which is why there are so many castles in and near the town. 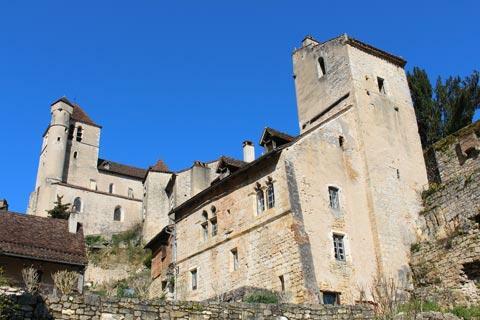 These include the imposing renaissance Castle of Cénevières, furnished in period style and in a raised position with lovely views across the Lot valley as well as various castles built in inaccessible places in the cliffs along the Lot and Célé valleys, together referred to as the Castles of the English. 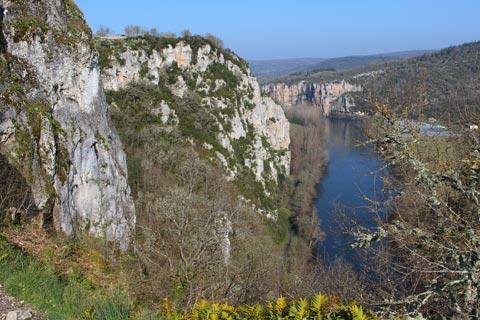 Other nearby places of interest include the prehistoric caves of Pech-Merle at Cabrerets and the Chateau de Larnagol. 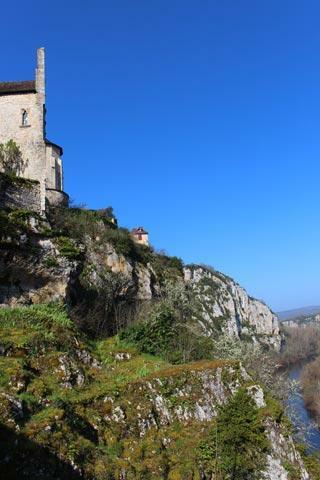 Much of the surrounding Lot Valley is also worth exploring: we first discovered Saint-Cirq-Lapopie as part of a journey between Figeac and Cahors along the lower Lot Valley, which was very pleasant.